New Year’s resolutions are often short-lived not bringing to fruition goals you want to achieve. They either take too much time to achieve, life gets in the way, or a desire for results seems more of a priority then behaving in a way that yields the results. We offer another choice in motivating us toward growth, improvement, and/or balance. Inspired by a presentation last week from Nathan McDade’s What’s The Word, pick your word! Words are everywhere we turn! The idea here is to select a word that will inspire, motivate, and importantly, remind you of goals you have chosen to improve your life. Unlike resolutions, your word does not have a deadline nor does it need to be accomplished in a pre-determined amount of time. 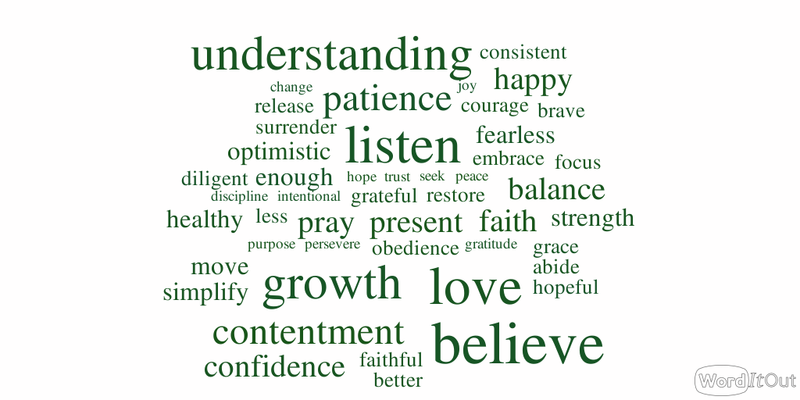 The purpose is to select a word that represents the change or growth you desire. It will serve as a guiding force for change as time passes. With the tools provided in the last week’s Perspectives regarding accomplishing resolutions, you may be another week closer to accomplishing your goal. If not, perhaps selecting your word may propel you in that goal’s direction this year. As Rosie Molinary, author of the book Beautiful You: A Daily Guide to Radical Self-Acceptance, said, “The power in claiming a word for the year is that it allows you to claim who you wish to be in the world rather than grounding your worth and well-being in what you do.” The theory of picking one word as opposed to setting goals may allow the accomplishment of a better you and impact the years to come. For some people, the word that emerges is not one that requires a lot of thought. For others, inspiration may be required. If a word does not come to you with ease, reflect on the past year. Is there an area of your life you want to improve? 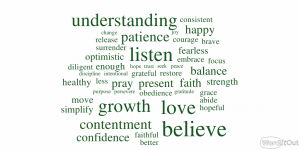 Once you choose your word, define how you will use your word of choice as a guide through the year ahead. Write down the ways in which the word will influence your life. After defining your word: Share it, print it out, hang it up, tell friends, write it on your mirror, and tell your family. Allow it to serve as a daily reminder of the person you want to become. You can even pledge your word at www.oneword365.com and join forces with those sharing your word. Cheers to a year of growth through the power of a word. PS. Barbara’s word is understand, Sydney’s word is believe. This entry was posted on Wednesday, January 14th, 2015 at 7:13 pm. Both comments and pings are currently closed.